the cheese chronicles: Blue Ribbon!!! Photo by Emiliano Lee, cheesemonger extraordinaire of Liberty Heights Fresh, Salt Lake City, Utah. It seems I only have time to jot down a few lines when we have momentous news. The news today? We just received a blue ribbon for our Chocolate Goat Cheese Truffles! We entered them into the American Cheese Society Judging and Competition being held in Montreal, Quebec. We actually had four entries, and got a ribbon for the truffles, not the cheese. Here is a list of all of the winners at American Cheese Society cheese contest. The best in show was awarded to fellow Oregonians, Rogue Creamery for their Rogue River Blue. Their second Best-of-Show in three years! We're thrilled for David, Cary, and the entire Rogue team for their success. They make some phenomenal cheeses. 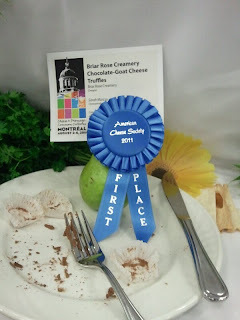 Our Chocolate Chevre Truffles were awarded 1st place in the "Fresh Goat Cheese, Flavor Added: Floral" category. When we were filling out our entry form, there wasn't a perfect fit for our truffles. Nothing that indicated sweetened cheese, confections with cheese, cheese with chocolate added, etc. We actually called the offices of the American Cheese Society to figure out the best category for our truffles. They were stumped, too. Finally we all decided that the flavor added "floral" category was the closest fit since the category also included fruit added. Chocolate is made from cocoa beans. The cocoa bean comes from a fruit, right? Close enough for us and ACS. And now a blue ribbon! Our truffles are still hard to get. We only sell them at our Farmers Market booth and special events and I only produce them when we have time in the cheese room to do so. We have a few retail outlets for them as well, but none have them in stock at this time. Check with them in a week or two, since we feel the need to reach out and offer them for sale. Outlets are: Lifesource Natural Foods in Salem, Oregon, Sundance Natural Foods in Eugene, Oregon, Cheese Bar and Elephants Deli, both in Portland, Oregon. I do not have the staff nor time to take retail mail orders, sorry. Shipping cheese or truffles in the summertime is not something I want to risk. Maybe once we're moved into our new creamery building we'll explore the possibility of shipping our truffles and cheese, but right now it isn't an option. Ah, well. If you want to try them, you'll just have to see us in person! We love that idea!